Long before I relished rasgullas and rasmalai, tasted tiramisu and tres leches, or polished off pies and puddings, the homely, humble and hearty burst-in-the-mouth churmundo, stood tall as one of my most favourite desserts in my early childhood. Memories of my granny, Amma and Pachi (aunt) sitting around a huge vessel and shaping these laddoos as I hovered around 'sampling' a couple here and a couple and a half there are still very vivid. 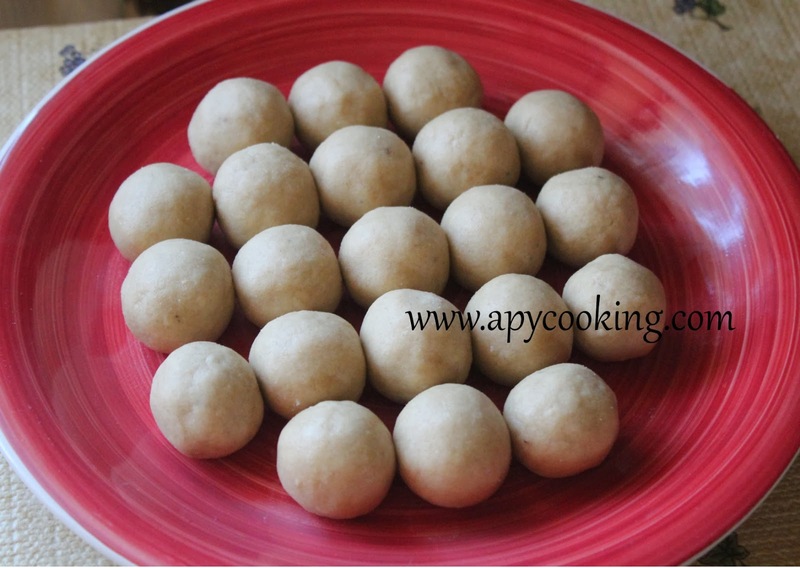 Today being the 4th 'Bloggiversary' of Apy Cooking, I thought of making these simple, easy laddoos just to walk down the memory lane a little bit, and sought help from my Pachi for the measures. There are a few variations to this laddoo - some people add besan (gram flour) and some prefer to throw in raisins and cashewnuts. I have kept it simple with the usual four ingredients. Note: Reduce sugar if you don't like the laddoos very sweet. Pour 1/2 cup ghee into a heavy bottomed pan and place on low heat. When the ghee turns slightly warm, add wheat flour little by little and keep mixing and roasting for about 10 to 15 minutes on low heat till you get a nice aroma and the flour appears to change in colour. Remove from heat and keep aside till it cools completely. Meanwhile, grind sugar along with cardamom (skin removed) in a blender for about 15 seconds till you get a fine powder. Add this powdered mixture to the roasted flour. Mix really well. Add another 2 tbsp ghee and mix well (knead with your palm). Grease your palms with a little ghee and taking about a fistful of mixture at a time, shape into lime-sized balls. 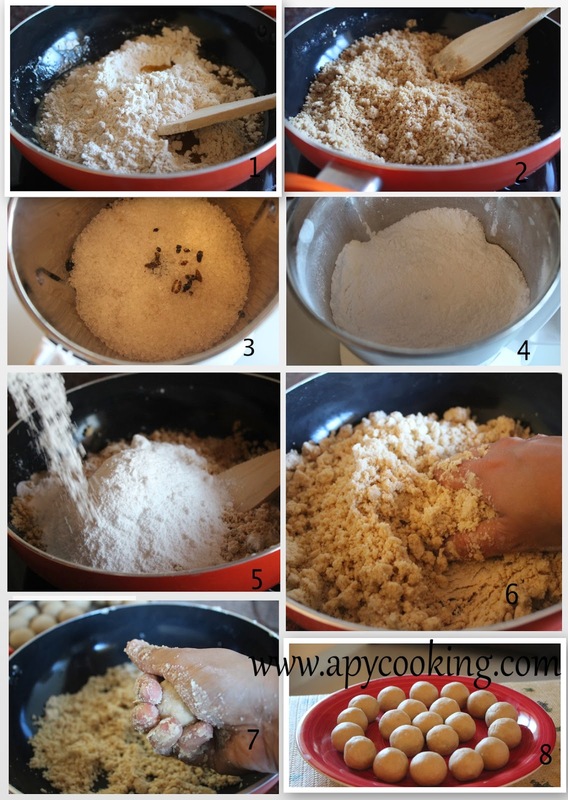 To shape the laddoos, press the mixture by tightening your fist and move it along the fist as you press it hard. As the laddoo gets it's shape, decrease the pressure, or else it can collapse in your palm. 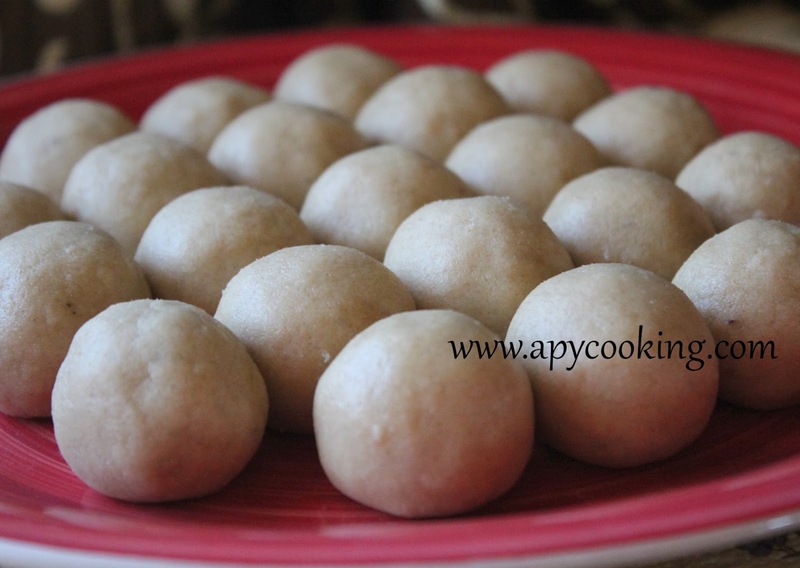 You can add a little more ghee to the mixture if the balls don't hold their shape. Just mix well again and rework the laddoos. 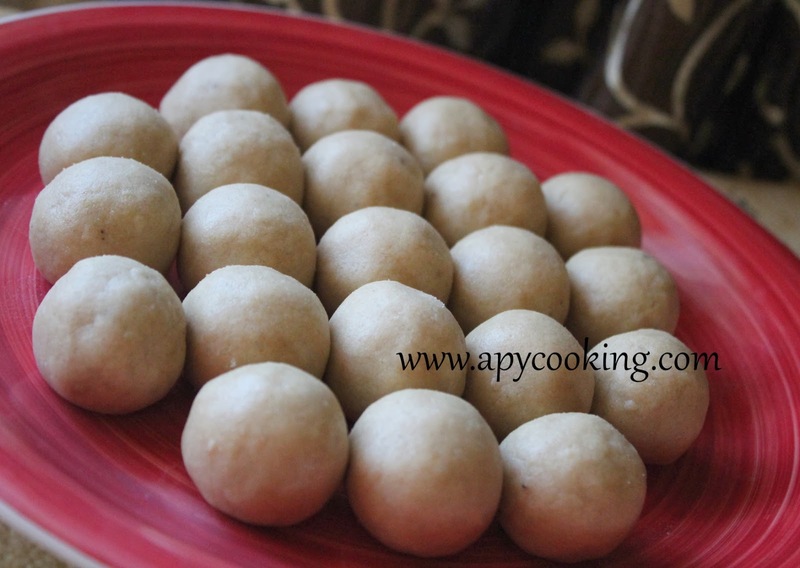 The recipe yields 20 to 22 laddoos.